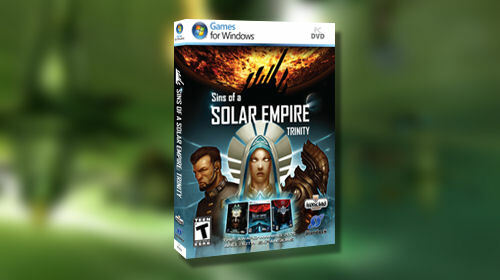 It seems like it was just yesterday when word of Ironclad Games' Sins of a Solar Empire: Trinity pack reached our ears. December and January have come and gone so fast, and now this all-in-one bundle is available for your co-op enjoyment at the reasonable price of $39.95 through Stardock's Impulse platform, or local retail outlets. As we mentioned before this pack not only includes the full version of Sins of a Solar Empire, a title we rather enjoyed, but the two expansions - Entrenchment and Diplomacy - as well. Trust us when we say, that's a lot of co-op gaming in one box, and a good way to spend a possible three-day weekend. Plymouth, MI – February 9, 2010 – Stardock (www.stardock.com) has unleashed the complete Sins of a Solar Empire experience today with Sins of a Solar Empire - Trinity. Trinity bundles the original award-winning real-time strategy PC title from Ironclad Games with the two game-changing micro-expansions, Entrenchment and Diplomacy. Sins of a Solar Empire - Trinity is available in retail stores across North America and via the digital download platform, Impulse (www.impulsedriven.com) for $39.95.